The past few years have seen a growing number of public debates over the future development of Hong Kong's Central District, including the pedestrianization of major roads and conservation of buildings and sites with historical significance. This symposium brings together professionals, academics and members of the general public to discuss the past, present and future of the Central District and envision ways for building a more sustainable and livable city. This event is held in conjunction with the public exhibition, "Reimagining Des Voeux Road Central 改變始於想像：未來的德輔道中" at the Central Market Oasis Gallery, March 15-28, 2016. http://dvrc.hk. Ms. Y.Y. 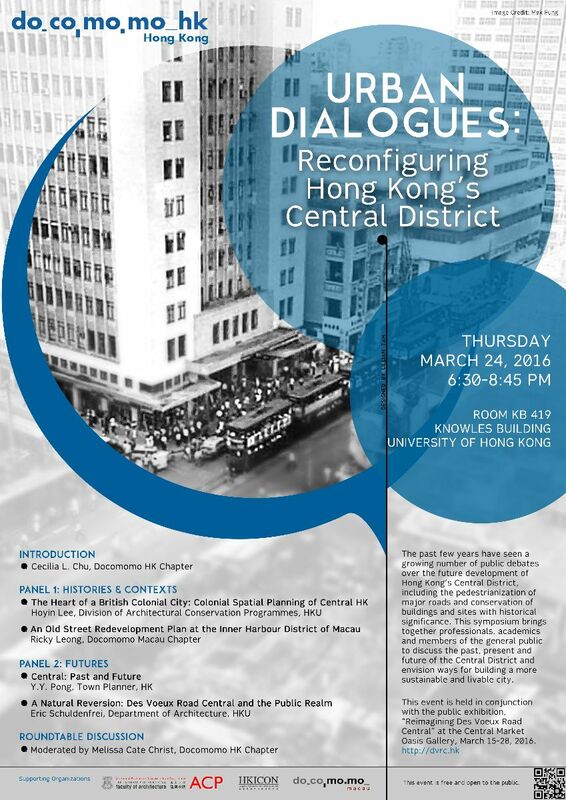 Pong, Town Planner would be on the panel to discuss a topic on "Central: Past and Futures". Please come out to support.